One of the main goals you have with your business is to increase its visibility and reach out to everyone. A great way to help you accomplish this goal is through the use of business signs. Of course, many people make the mistake of choosing flash over substance. The main thing to remember about your business sign is that it needs to rely upon all the elements working together. 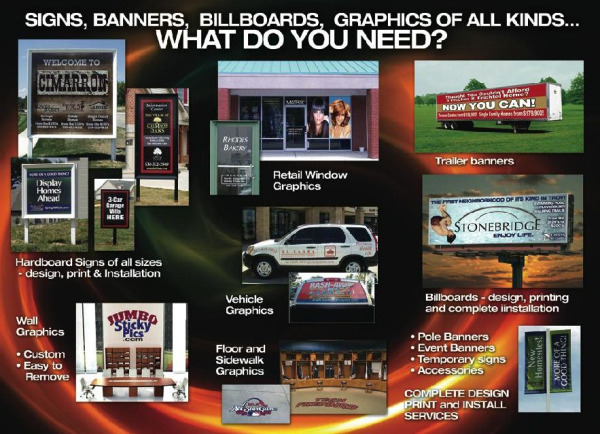 This includes the colors, graphics, text, message, and even the size of the sign itself. This also means that you need to make your signage seem obvious. Place it in such a position that customers and potential customers cannot help but see it. Use the proper size and height. Think about how the various colors and images will contrast and work together with each other. Even the actual colors chosen and their brightness or font sizes might make a difference in how visible and noticeable your sign ends up becoming. For more information, Download our Visability Guide. After reading your business sign, the prospective customer should come away with knowledge they didn't have before. This means making it informative, which leads to a higher level of effectiveness. An easy start to this is including all of your business contact information: name, logo, phone number, website, email, and even physical address. You can also include additional information to enhance the effectiveness of your business sign communication. Make an announcement of a special sale, discount, or offer. Maybe you could even display store policies for refunds, exchanges, or include specific product descriptions. An outdoor business sign should be able to help guide people to your location. Even those who might not really be in the market should end up with a clear idea of who you are and what you do. Making the sign legible (the proper size and location) and colorful are some of the keys to an effective outdoor sign. Once someone is inside your business, your indoor signs should continue offering help and guidance. There should be signs to help identify the various store departments and specific areas can help customers find exactly what they are looking for quickly and easily. These types of signs can also be used to give information about specials and promotions as well as guiding customers to new and popular products and services. Indoor signs can also include menu boards, digital signs, service lists, and anything else that is a display inside your business. These offer helpful solutions and guidance during the actual time of purchase and can even increase profits by suggesting impulse and additional items at checkout. Of course, you should ensure that your point of purchase displays are organized, visually appealing, and provides information in an organized fashion. Signs really come in many different forms. Consider the vehicle wrap or a promotional product to be another type of business signage. They have an amazing ability to get your business noticed and help increase your sales and profits. The same is true of trade show displays, which can help promote you all over the country. To find more about how The Sign Studio can help your business increase its visibility, reach sales and profits, contact us today at (818) 843-9200 or send us an e-mail at Info@SignStudioLA.com.